One of my New Year’s Resolutions is to help bring empathy, empowerment and equity to every classroom out there. With that in mind, I’ve joined a group of compassionate, caring, and creative educators to bring you monthly posts highlighting ideas for developing the 3 E's in your classroom and school community. Our goal is to make it easier for you to include these values in your every day teaching by offering ideas and free materials to support your teaching endeavors. Now, more than ever, nurturing EQUITY, EMPATHY &amp; student EMPOWERMENT is crucial for all our students. basically consisted of teaching academics. Social Skills were learned at home. It was the job of the parents to teach their child to say please and thank you, to respect adults, to treat others the way they would like to be treated, not to talk to strangers and so on. Now-a-days, a teacher’s job has changed in so many ways. A large amount of our charges have not learned how to relate to others in the world around them. So we’ve had to set up Character Building lessons to help them learn empathy for others, how to deal with that bully, to wait their turn, and so much more. I can only speak for myself, but I bet that many of us have not even thought about speaking with our students concerning using good manners when commenting on that blog post, or stating opinions on social media sites. Not only do our classes need to be educated about online etiquette, or netiquette, but they have to learn to be careful about what kind of information they share online, there are many predators. It is important for them to understand that they should never give out personal information, unless they know who they are talking to and it is someone that they can trust. It’s a scary world out there and now it is getting smaller due to the world wide web. 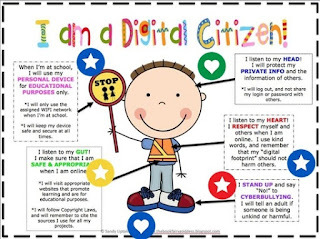 Say hello to Digital Citizenship. 1. Before you post a blog, or a comment, read it out loud, see how it sounds. Remember that you are communicating with another person who cannot see your face, or read your visual clues. What you mean to say may not always come across the way you meant it. So you need to be careful of the tone that you’re using. Remember, treat others the way you want to be treated, with compassion, generosity, kindness and a spirit that shows forgiveness..
2. Don’t type in all capital letters, it looks like you’re yelling and you will turn people off. 3. Remember that whatever you say online will be there forever. This is known as your digital footprint. You don’t want something that you’ve written online to come and haunt you years later. If you're not sure about what you've written, ask yourself how you'd feel if someone said that to you. to where you got it from. 6. Be safe, don’t give out personal information. 7. Whatever you write online is subject to criticism, there are people who may not agree with you and wil say so, and sometimes not in a nice way. Try not to get offended by what they say. If you reply back, do it constructively and with kindness. comments, there are many cyber-bullies out there. you'll feel by not sinking to their level. There is a wealth of information on the net to help improve digital citizenship. 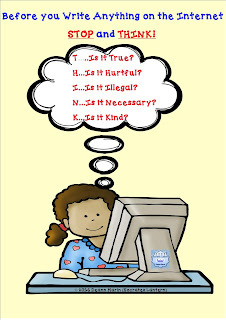 I'd like to share a simple acronym that I found online which your students should learn to ask themselves befoe postng on the web. The acronym is THINK....which many people do not do. An instructional technology coordinator, Jay Sonnenberg, in Katy,TX, came up with a wonderful way to teach empathy to his students through the use of cell phone text messaging. He created a "Text it Forward," initiative in which students were to text positive affirmations, and encouraging messages to their friends. This was done through a text messaging service called "Remind." As you can well imagine this worked like a charm bringing everyone closer and created a more caring environment. This is what Sonnenberg said about the program, "It really helps our students see that our entire district is in this together and we have a common goal of being productive members of our online community.” His students created this video that I'd like to share with you. 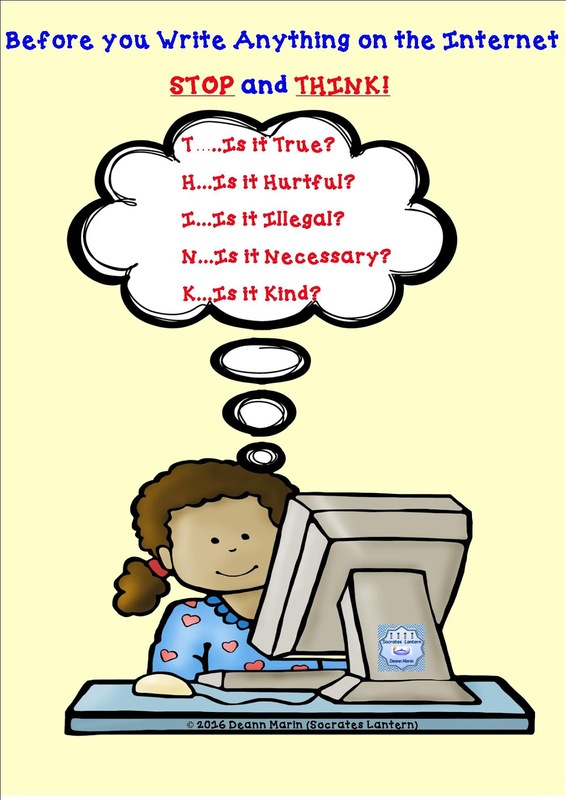 Here's a poster that you can use in your classroom to remind your students that they should always strive to be a positive and empathetic digital citizen. Misc. Lesson - "Social Skills for Teenagers"
Misc. Lesson - "Following Directions All Year"
Do you want to make a Groundhog?